Royal Rose Radicchio is featured in Lidia Bastianich’s newest book Lidia’s Italy in America. 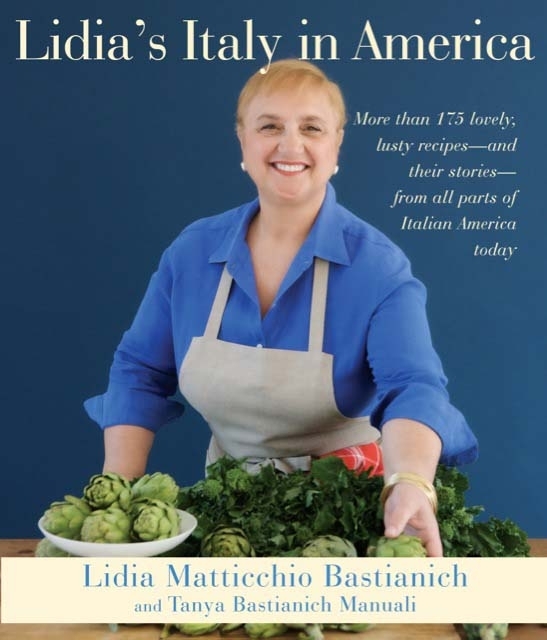 Lidia, her daughter, Tanya Bastianich Manuali, and their film crew, toured and photographed a mature radicchio field ready for harvest in Salinas, California last summer. Royal Rose fields and produce are featured two different sections of the beautiful compilation (pages xiv and 99). The brilliantly photographed book includes recipes for Radicchio and Beet Salad, Radicchio, Endive, and Walnut Salad, and Radicchio, Goat Cheese, and Raisin Salad. Previous cookbooks written by Bastianich have included radicchio pastas and warm salads as well. This entry was posted in books, chef, italy, radicchio and tagged books | chefs | cooking | italy | lidia | radicchio | royal rose by admin.royalrose. Bookmark the permalink. That’s unbelievable. I’ll need to have Jeff try those out. He does the desihs. 🙂 And the stuffed shells look amazing. Whenever my mom makes stuffed shells, she uses any broken shells to make me a tray of unstuffed shells. I do love the stuffing but sometimes I prefer more of a baked ziti-ish version. Jeni: I miss you guys too!A: Shintaro is good- I work near there and go often for lunch.A: Ike is great if you sit in front of Ike. Otherwise, just ok in my experience.I have to say Takumi is very much like the Katsuayas and Sushi Roku’s of the world- lots of style, little substance.foodette: Will have to try it, thanks for the tip!